Even four days after the best World Cup final I have ever seen, I am still brimming with the euphoria that only seems to accompany el jogo bonito (the beautiful game) in its finest form. What a spectacle it is. Teams from 32 nations around the planet vie for supremacy of being called the world’s best team. Remember that word, T-E-A-M. This Tweet was widely re-Tweeted after Germany crushed Brazil 7-1. A great shot published on game day of the victors celebrating their win in the biggest sporting event in the world. I watched more matches than I planned to, and found myself swept away, as always, in the massive melodrama that captures the world’s attention every four years. This year was no exception. Uruguayan Luis Suarez bit an Italian opponent like a zombie. The host team lost in the biggest knockout-round blowout ever in the Cup, 7-1, to winners Germany after its star player, Neymar, had his back broken. One nation, Cameroon, was alleged to have thrown a game. And of course there were countless displays of sheer athletic brilliance like goals scored by Colombia’s James Rodriguez and would-be goals blocked by U.S. keeper Tim Howard. 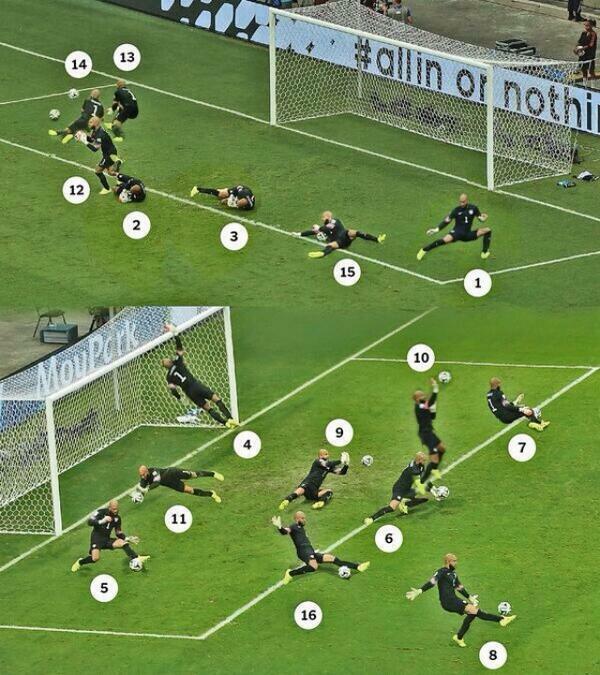 An Internet meme beautifully shows how U.S. keeper Tim Howard blocked the goals against Belgium. It is estimated the final match that saw Germany top Argentina in a 1-0 nail-biter decided in the 113th minute drew about 26 million viewers in the United States. 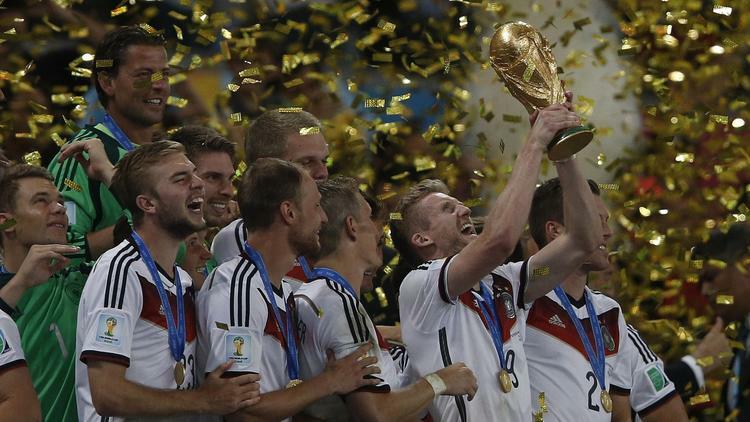 In Germany, about 35 million fans watched the game on TV, not to mention public viewing areas. Globally, around the world about 1 billion may have watched, but I suspect the number was higher. I doubt they count small bars in rural China and Africa and other remote spots. Mario Gotze scores the winning goal against Argentina, as shown in possibly the penultimate game photo of the tournament. And what a great final game it was, with a brilliant end. Germany’s André Schürrle darted down the sideline and sent a perfect cross to teammate and fellow late-game sub Mario Götze. Super Mario trapped the volley with his chest and blasted the ball to the side of the net. GOOAAAAALLLLLLL!!!!!!!!! Where I was watching the game in Seattle at a neighborhood center, half the room went nuts, with orgiastic screaming. Half the room cheering for a great Argentina side fell stunned silent. That is pure World Cup emotion, and there is absolutely nothing else like it in the world. Period. Some researchers have said events like soccer have a hormonal factor in a brain peptide, oxytocin, that research shows promotes positive intersocial relations. It is called the “love hormone” because it makes people like one another, especially in intimate relationships like mother and child. Research shows that players’ exhibitions of emotions like happiness and confidence, as in after a great play or goal, can be contagious, when a person’s excitement triggers biochemical reactions in onlookers’ brains. That is precisely what happened at the same moment around the globe when everyone watching the game on TV and giant screens saw the emotions on the German team members’ faces after the goal. Bam, oxytocin discharge, followed by social media frenzy. Social media globally turned into a raging wildfire. Twitter sent more than 600,000 Tweets a minute after the match on July 13 and more than 670 million Tweets by the next day, more than ever before in its short history. On Facebook, there were 280 million interactions such as posts, likes, and comments—the most for a sports event. It was a sports event and a social media happening of historic proportions at the same time. Small wonder German Chancellor Angela Merkel was at the stadium hugging the sweating German team one by one, and even posed for a selfie with starter Lukas Podolski, and soon that Tweet blasted around the world. 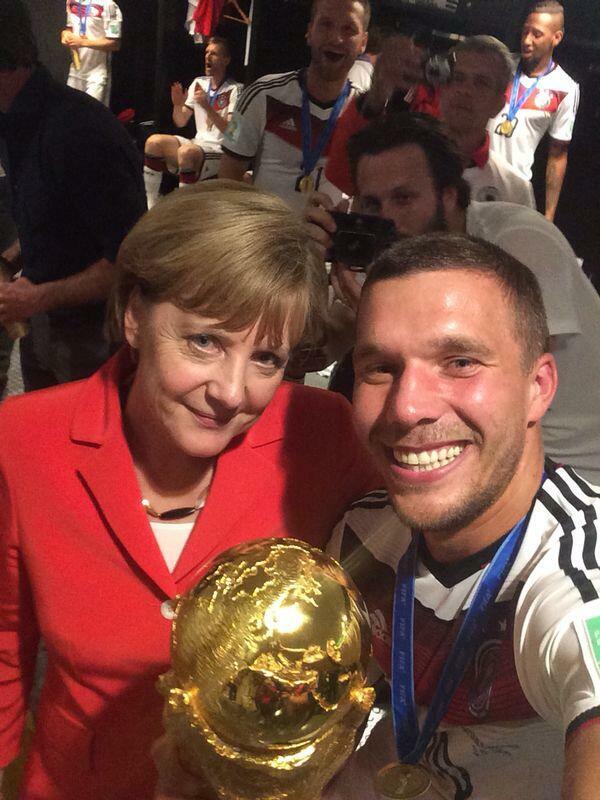 Lukas Podolski tweeted this selfie of him and the German leader right after the game, in a Tweet seen ’round the world. So it is no boast the singularly most important global event of the past month was the Cup, despite all of the raging conflicts that continued during its course. People the world over adore it, and go crazy over it, and weep and moan over like, like the entire 200-million-person host nation of Brazil did after the German team brutalized the host team 7-1 in the semi-final blowout that was a record-breaker of historic proportions. Professionally, the game is easy to grasp. It has simple rules, a 100 meter pitch, three referees, and 22 men making up two teams who are fiercely competing for the title of best national team on the planet during Cup time. I love the Cup because it, more than anything else, is a common denominator that I have with someone in remote Greenland; and Munich, Germany; and Kampala, Uganda; and Rio de Janeiro, Brazil. No matter where I go, I can always talk about the Cup, and I will have a well of good feelings and excitement to draw upon. 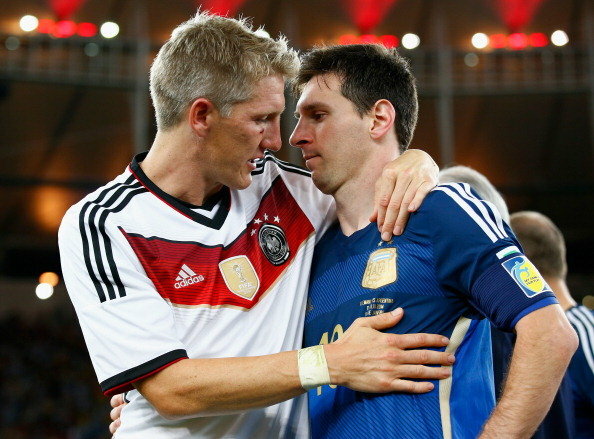 This is one of the best shots after the game: Lionel Messi of Argentina is consoled by Germany’s Bastian Schweinsteiger. What I most liked about this year’s final game was the near-perfect match of two really outstanding teams. In fact, the two best teams showed up in the Maracana stadium, and both played great team soccer. Passing was strong, there were not many dirty tackles, and both sides had great scoring chances, only to see them squandered. Argentina actually blew three golden opportunities, including one by Messi inside the box, with no one close enough to shut him down. With the exception of two horrible concussions during the game, one to each side that later forced commentators to blast FIFA’s system and led to many calling the contest the “Concussion Cup,” the game was without flops or debilitating injuries. Despite the excesses and corruption of the world football governing body known as FIFA, for me, Brazil’s 2014 Cup was a great reinforcing example of the power of teamwork. Organizational behavior theorists have long championed Naval researcher Bruce Tuckman’s famous four stages of group performance from his seminal 1965 article (Development Sequence in Small Groups): forming, storming, norming, and performing. When groups are clicking as a unit, they can achieve well above their own individual abilities and, if really good, as in high-stakes activity like conflict and sport, achieve greatness and victory. As someone who played soccer most of my life from youth to middle-age, I can attest to the power of teamwork and how effectively groups with lesser abilities can overcome better opponents who do not have that cohesion. Germany had the team magic. It was obvious the whole tournament. There were great plays by the German team stars like Thomas Müller, even very great plays like Götze’s winning blast, but all of the German team members contributed to their success. The perfect example was forward Miroslav Klose, 36, and veteran of four World Cups and likely the most underrated player in the world. He scored two in the Cup, both lovely. In the victory over Brazil, the “poacher” scored his 16th Cup goal (see all here), more than any other player in the history of the Cup. He did it as he always did, getting great service from his teammate, and always following up when his first shot was blocked. This photo captures a perfect moment: forward Miroslav Klose scores his 16th World Cup goal against Brazil, a record and a lasting tribute to a great team player. Klose is not pretty. He is not charismatic. He does not smile often, and he is a quiet family guy. In fact, his lack of flash allows defenders not to respect his killer instinct as a finisher. Most of all he has succeeded in making history by being part of a great team that worked relentlessly at being the best at what it did, and then did it in the highest possible stakes game there is in the world. My hat is off to the German, and Argentinean, teams. Thanks for making this Cup memorable and for showing how two great teams play the best game in the world.